- New Web storage function and new Web SQL database storage. - How to use Web workers and Web sockets. - Audio, Video and Canvas manipulation on HTML5. That's so cool! 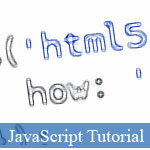 HTML5 is really new cool web technology, supported by many giant web/internet companies. Try it, master it now asap. Moreover there's now possibility to fetch elements that match provided CSS syntax! A user could be buying plane tickets in two different windows, using the same site. If the site used cookies to keep track of which ticket the user was buying, then as the user clicked from page to page in both windows, the ticket currently being purchased would "leak" from one window to the other, potentially causing the user to buy two tickets for the same flight without really noticing. Web applications may wish to store megabytes of user data, such as entire user-authored documents or a user's mailbox, on the client side for performance reasons. Again, cookies do not handle this case well, because they are transmitted with every request. Well, sessionStorage has been created to let developers cope with first of above troubles. It keeps data in per tab storage. To get along with second one, W3C has introduced localStorage - the persistent storage that never expires. Database is stored on client's computer so it's secure. Web SQL Storage is available even if client went offline. But if we want create fully-functional offline aplication, we must care about resources like images, CSS, JS and et caetera. It's high time to familiarize with Application Cache API. We create cache.manifest file and link to it from html element. You may find full list of Application Cache Event Listeners here.